Foot Notes: Telling Stories of Girls’ Soccer reflects on 35 years coaching girls’ and women’s soccer. It’s a bit memoir, a bit of guidebook, a smattering of literary commentary, a dose of nostalgia and confesstional, sprinkled with some sports journalism. 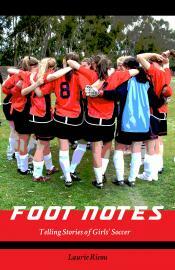 Foot Notes urges attentive listening to other’s stories as it shapes, shares, and cherishes stories of girls in soccer. ~Andrea Neil, Canadian Women’s National Team 1990-2007. First woman soccer player inducted into Canada’s Sports Hall of Fame.